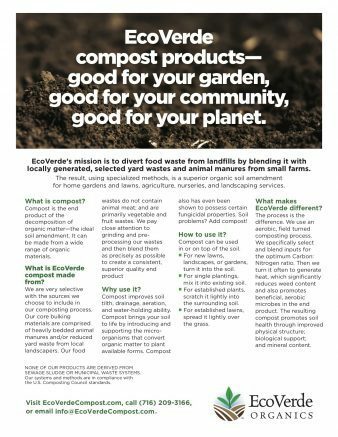 EcoVerde Organics diverts food, animal and yard waste from landfills and other sources to produce high-quality organic soil amendment compost. EcoVerde Organics, LLC, a Western New York-based company that diverts food, animal and yard waste from landfills and other sources to produce high-quality organic soil amendment compost, has received a $450,000 investment from the WNY Impact Investment Fund, according to Warren Emblidge of EcoVerde. The funds, which came as a mix of equity and debt, will be used as working capital to accelerate the company’s growth as it works to bring its primary product, Full Circle Compost, to market. Formed in 2017, EcoVerde’s main focus is to collect waste, such as food scraps, animal waste/horse manure and yard waste, divert it from landfills and turn it in to fully organic compost that allows homeowners, landscapers and farmers to create healthier, more organic soil for improved lawn quality and a higher yield and larger size for crops. “Healthy soil has many environmental benefits,” says Emblidge. “It is full of much-needed nutrients and microbes, which greatly decreases the need to use chemical fertilizers to amend the soil. Healthy soil also retains moisture very well, requiring less-frequent watering, thereby lowering water usage and decreasing runoff into our waterways – runoff that includes nitrogen and phosphorus that cause toxic algae bloom. To date, EcoVerde has collected more than 500 cubic yards of food waste from food service operators, animal waste and horse manure from local stables and yard waste from local municipalities and landscapers, diverting it from landfills or incineration. Emblidge says that within the next few months, the company will have approximately 300 cubic yards (or approximately 4,000 two-cubic-foot bags) of compost available for consumer use. For additional information or to order Full Circle Compost, visit www.ecoverdecompost.com. EcoVerde Organics represents the initial investment the WNY Impact Investment Fund has made since opening its doors in the fall of 2017. The Fund also recently invested in Viridi Parente, Inc., which builds clean/renewable power systems that utilize proprietary drive systems for industrial applications. Viridi Parente is looking to expand its operations in the former American Axle facility on East Delevan Avenue on Buffalo’s East Side. The WNY Impact Investment Fund is currently pursuing several other investment opportunities, with plans to complete at least one additional investment by fall 2018. Be the first to comment on "WNY Impact Investment Fund invests $450,000 in EcoVerde Organics, LLC"